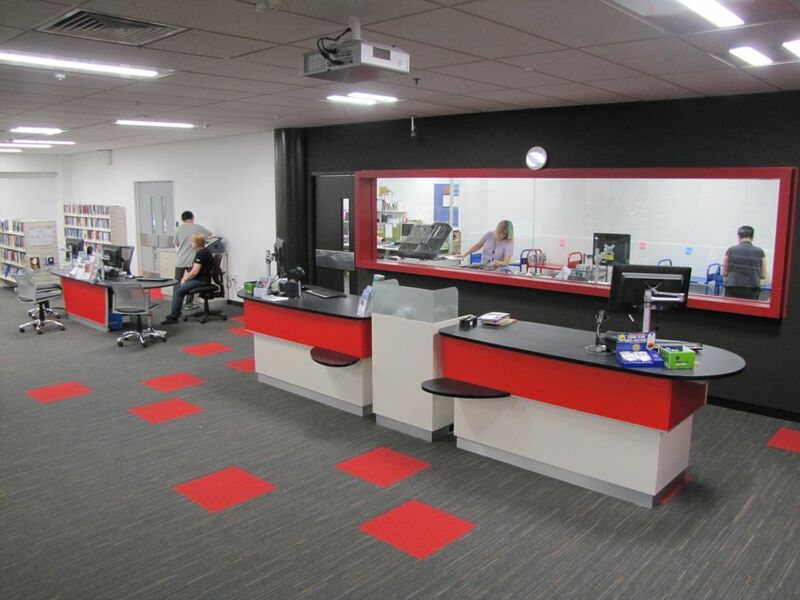 Instinct Furniture was thrilled to be involved with the refurbishment of Takapuna Library – a key Auckland Council Library. 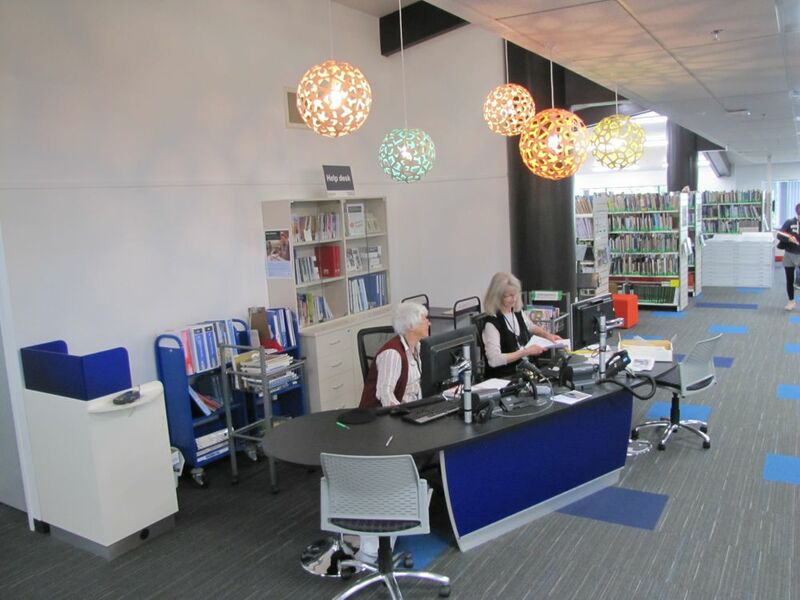 Paul White, our Director of Design, worked closely with Helen Woodhouse (Library Manager), Anne Betts (Customer Services Librarian) and Marion Weatherley (Facilities Coordinator) to design staff stations for the front of house and throughout the library. The new installations replaced counters supplied by Instinct Furniture back in 1998 when ‘fixed height’ was the norm. 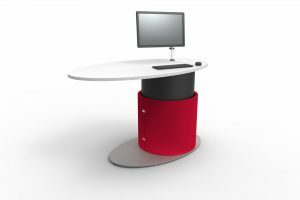 Since then counters have evolved, and as a result of in-depth ergonomic analysis to minimise counter related injuries, Instinct Furniture’s counters are now predominantly push-button height adjustable. 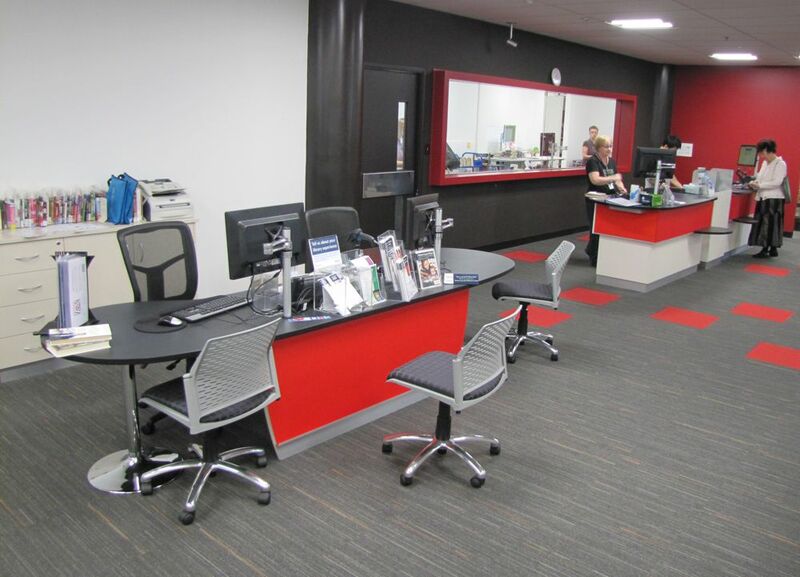 Takapuna Library wanted to make the move to height adjustability to enhance customer experience with a more open and spontaneous feel. 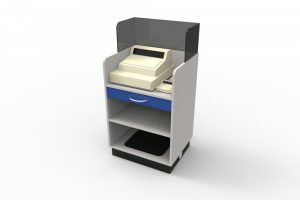 On entry to the library, two STEALTH 2100 counters and our BOOKFLO CASH Module now take pride of place, forming a dynamic circulation area. 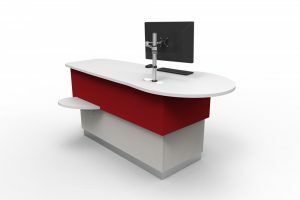 STEALTH is freestanding, retaining the appearance of a traditional counter whilst providing height adjustability and easier connectivity with customers. Adjacent to STEALTH sits our Socrates CLIENT DOUBLE Help Station, designed to be friendly and welcoming and allowing a controlled interchange between staff and the customer. The striking, bright red frontages of these three counters complement the architect’s contemporary decor. On the upper level another Socrates CLIENT DOUBLE provides help just where it is needed; this time with a vibrant blue translucent frontage and teamed again with our BOOKFLO CASH Module. The area is further energised by an array of David Trubridge light fixtures, chosen by the architect. 1. The librarian in the Angela Morton room (a collection containing books and resources about the visual arts of New Zealand) chose our BEAN Counter, crafted in Oak Veneer. BEAN is all about ‘open library’ – a minimal footprint with maximum features that combines issues with help function. 2. 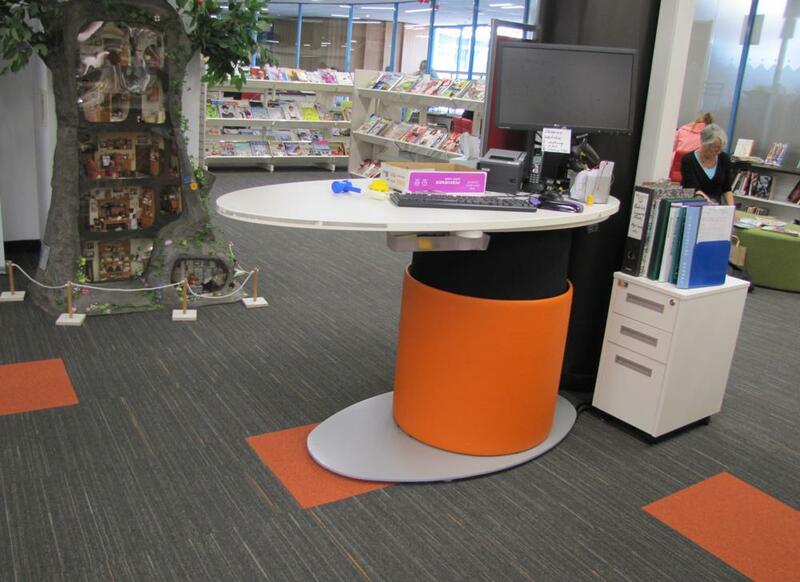 The children’s librarian chose YAKETY YAK Oval, featuring soft organic styling that invites the parents and children to engage. YAKETY YAK sits happily in the midst of the children’s area, as a help point and meeting place. Takapuna Library can be proud of their new library environment. It is not just vibrant and inviting, it supports a healthier, more comfortable workplace enabled by height adjustability. 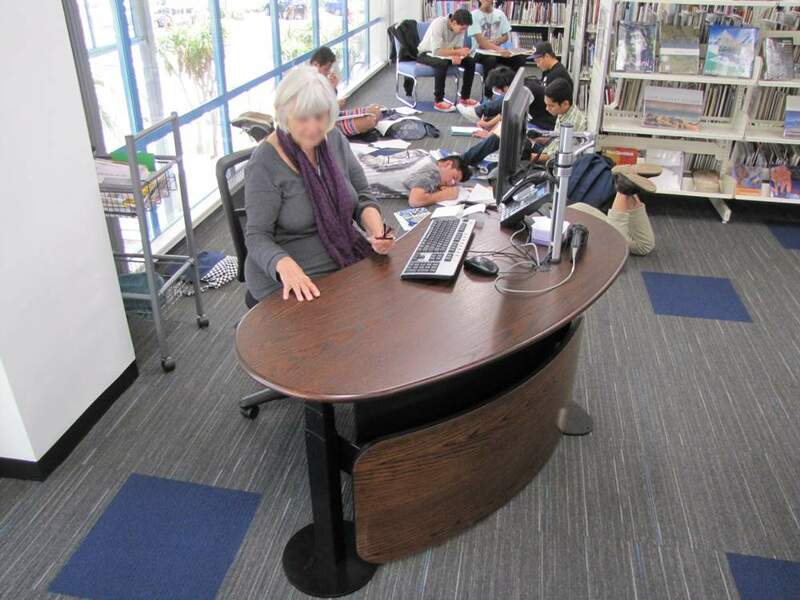 This, in conjunction with the interactive nature of the new furniture, allows for an enhanced customer experience.